A new multi media dance work, Broken. A co- presentation with Portal Dance and Guelph Dance a new multi media dance work, Broken, a raw and intimate look at how we endure and adapt during times of destruction. 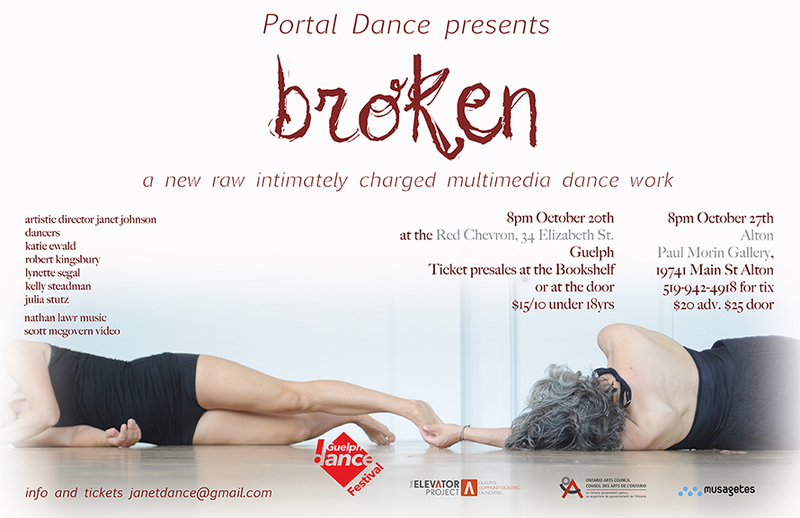 On Friday October 20, 2017 at 8 p.m. the Guelph based contemporary dance company, Portal Dance will be premiering Broken at Guelph’s Red Chevron, 34 Elizabeth Street (a physically accessible location). In a highly abstract way Broken is looking at destruction, mass waste & how we break but then adapt and survive… like a mine field that later grows flowers. * Also, drinks available before, during & after show at the Red Chevron tavern below!